A simple injection of your own platelet rich plasma into your scalp to help regrow hair. Hair loss can be a stigmatizing, upsetting, and embarrassing issue. Male and female pattern baldness is a genetic problem that can leave one feeling helpless. Many options for hair loss exist including: prescription drugs, topical therapies, light therapies and vitamins. Often partially effective, other therapies carry the potential for unwanted side effects. Surgical hair restoration can be expensive and does not treat potential underlying medical problems. Now there is an affordable way for you to improve your hair density without surgery or other harmful side effects. Platelet-Rich Plasma (PRP) for hair restoration involves a simple injection of your own platelet rich plasma into your scalp to help regrow hair. Platelets contain healing growth factors. These growth factors when released are like signal callers that give instructions to your tissues to regenerate and multiply. The benefits of your body’s own growth factors has lead different fields of medicine to utilize PRP for wound healing to speed up recovery time and regrow healthier, stronger tissues. Now, dermatologists have discovered new benefits for hair thickening and regrowth for hair with PRP. Your own growth factors and stem cells will work together to reverse the miniaturization of the hair follicle and jump start dormant hair follicles back into the growth stage. A quick series of injections spaced 1 month apart will involve the collection and concentration of your body’s own platelets using a very easy three-step process. Am I am a good candidate for PRP? Visit us for a consultation to determine a proper alopecia/hair loss diagnosis and to create a treatment plan. Depending on your other medical conditions PRP may not be the right choice for you. How many treatments are required? Treatments vary based on need, but typically we recommend 4 treatments spaced 1 month apart as initial therapy. After the initial treatment, maintenance treatments 2-4 times per year is suggested. Is PRP for hair restoration a time consuming process? No. Collecting PRP typically takes 10-15 minutes. PRP injection treatment itself usually takes as little as 3-5 minutes. Does the PRP injection procedure hurt? There may be some sensitivity and a sense of fullness with injection. However, anesthetic solutions, such as cold ambient air or a topical analgesics may also minimize any potential discomfort. Is there recovery time? There is typically no downtime or a long recovery process. You may take a warm shower the evening of the treatment. In addition, it is advised to avoid using any harsh dyes or chemicals on your hair for 48 hours. 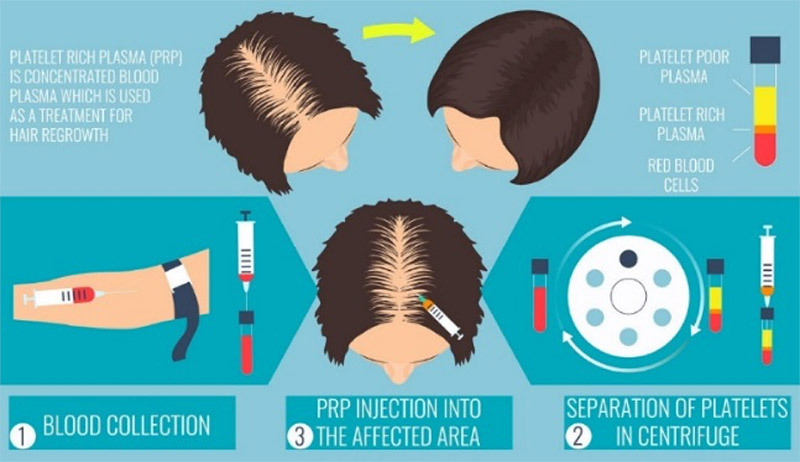 Is PRP a cure for baldness? PRP is not a cure for baldness (Androgenic Alopecia). The genetic medical problem will always remain. However, there is evidence that regular treatments can significantly slow down the effects of Androgenic Alopecia and the procedure works to increase hair density.